The Union environment ministry, it seems, is not serious about dealing with plastic waste. While notifying the plastic waste management rules on February 7, it banned use of plastic in only gutkha, paan masala and tobacco sachets. No other form of plastic packaging has been banned by the Plastic Waste (Management and Handling) Rules, which replace the Recycled Plastics Manufacture and Usage Rules of 1999. 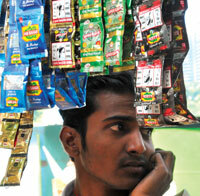 “Gutkha packets are made of metalised plastic, so are potato chips packets and shampoo sachets. The ministry should have banned all forms of metalised plastic,” said Bharati Chaturvedi of Chintan Environment and Research Action Group that works with ragpickers. She was a member of the ministry’s expert panel set up to look into objections to the rules at the draft stage. The notified rules target paan parag and gutkha because the Supreme Court has banned plastic packaging of these products from March 1, she added. The draft rules of 2009 had proposed a ban on laminated metal coated and multi-layered packaging (using plastic, paper and foil) as they cannot be recycled. This meant packaging used for potato chips and tetra packs would have been banned. When asked why metalised plastic packets of other products have not been banned, Rajiv Gauba, joint secretary in the ministry, justified the rules saying gutkha packets are the biggest contributor to metalised plastic waste in urban areas. He did not give a figure to substantiate the claim. The rules also mandate municipal authorities to set up centres for collecting and recycling plastic waste for which they can ask manufacturers to provide the funds. Expert committee member Ravi Agarwal of the non-profit Toxics Link said the rule was diluted. “We had suggested the centres should be both set up and managed by the industry. The rule is clear about the funding but ambivalent about managing recycling centres. Only the plastic industry could have influenced the change,” he said. The new rules say the poly bags that shopkeepers give free to carry groceries and other items should be at least 40 microns (0.004 millimetres) thick. The rules say all plastic bags should bear labels specifying thickness, quality of plastic, whether recycled, and the name and registration number of the makers. Previous rules said plastic bags should be minimum 20 microns thick. Gopal Krishna of Toxicswatch, an advocacy group working on solid waste, said the cardinal principle of waste management is to avoid generation. “With bags of 40 microns in place of 20, we are just bringing in more plastic,” he said. But Reema Banerjee of the Centre for Environment Education in Ahmedabad said increasing thickness of poly bags to 40 microns will encourage recycling; 20 micron bags are hard to recycle. While plastic bag makers appeared satisfied with the new rules, producers of compostable plastic bags are angry. The rules say “determination of the degree of degradability shall conform to the Indian standards” and bans use of compostable plastics for packaged food (see box). “Other countries are promoting compostable bags. We will become the laughing stock of the world if this rule is implemented,” said Perses Bilimoria of Earthsoul India, which makes compostable bags from potato starch. “The 40 micron specification does not work for us because compostable bags degrade on their own,” he added. Gopal Krishna said the clause ‘degree of degradability’ sounds inane because either a bag is degradable or not, there is no midway situation. Krishna also criticised the use of plastic bags in road construction and their incineration in cement kilns the Rules recommend. “This is nothing but landfilling and burning of plastic,” he said. The new rules got some praise, too. It recognises the role of ragpickers which is a “historic first”, said Chaturvedi. But the rules sound good only on paper, said Shashi Pandit, convener of the ragpickers association, All India Kabaari Mazdoor Sangathan. With even door-to-door waste collection getting privatised, ragpickers have lost all rights over waste segregation and recycling. Not a single waste management contract in India is supported by the workers’ association,” he said. Till now i didnt know that chips packs cant be recycled. I stopped using polythene bags. So, now i wont eat chips, biscuits too. Its an eye opener.